Grab the kids, bring your appetite and put on your thinking caps and join us for trivia night every Wednesday! KIDS EAT FREE is available all day and evening every Wednesday. One free item from the kids menu with purchase of an adult entree. 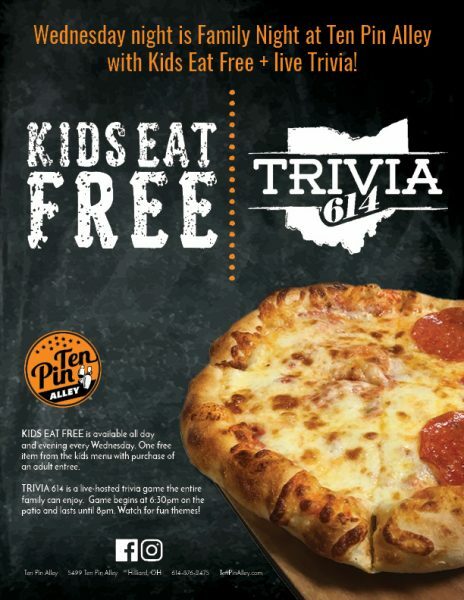 TRIVIA 614 is a live-hosted trivia game the entire family can enjoy. Game begins at 6:30pm on the patio (or restaurant) and lasts until 8pm. Trivia consists of 1 game with multiple fun and interactive questions. Watch for different themes! Receive the latest on specials, events, leagues and more. Plus get sneak peeks, special coupons and offers only available to members! Enter your email below to sign up today. Don’t miss out on what’s going on at Ten Pin Alley!